"Metrô" redirects here. For the Brazilian new wave band, see Metrô (band). The São Paulo Metro (Portuguese: Metropolitano de São Paulo), commonly called the Metro or Companhia do Metropolitano de São Paulo (CMSP), is one of the rapid transit companies that serves the city of São Paulo, alongside São Paulo Metropolitan Trains Company (CPTM) and ViaQuatro, forming the largest metropolitan rail transport network of Latin America. The six main lines in the metro system (Lines 1, 2, 3, 4, 5 & 15) operate on 96.0 kilometres (59.7 mi) of route, serving 84 stations. The sixth line, Line 15, is a monorail line that partially opened for service in 2014 and it is the first high capacity monorail line of Brazil. In 2016, the five lines operated by CMSP (Lines 1, 2, 3, 5 and 15) achieved an average weekday ridership of 4.3 million, and provided 1,107 billion rides over the course of 2016. The Companhia do Metropolitano de São Paulo (Metrô) was founded on April 24, 1968. Eight months later, work on North-South line was initiated. In 1972, the first test train trip occurred between Jabaquara and Saúde stations. On September 14, 1974, the segment between Jabaquara and Vila Mariana entered into commercial operation. 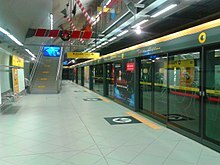 This is the most modern metro system in Latin America, being the first in the region to install Platform screen doors in a station (2010), Communications-based train control for signaling (2010) and 100% automatic train operation (Unattended Train Operation - GoA4 - on Line 4 - Yellow, in 2010). In August 2015, it was chosen one of the best metro systems of the world by the American magazine Business Insider, being the only system in Latin America to belong to the list. The greatest number of passengers ever carried by the Metro on a single day is 4,916,659, which took place on November 14, 2013. During that year, the São Paulo Metro transported a total of more than 1,297 billion passengers. The system is interlinked with CPTM (São Paulo Metropolitan Trains Company) at Brás, Palmeiras-Barra Funda, Tatuapé, Corinthians-Itaquera, Tamanduateí, Pinheiros and Santo Amaro stations, and at other modal transportation terminals in the city of São Paulo. The São Paulo Metro was voted Best Metro Americas at the MetroRail 2010 industry conference. The metro system consists of six color-coded lines: Line 1 (Blue), Line 2 (Green), Line 3 (Red), Line 4 (Yellow), Line 5 (Lilac) and Line 15 (Silver), operating from Sunday to Saturday, from 4:40 AM to midnight (1:00 AM on Saturdays). Line 15 (Silver), is a high-capacity monorail. The metro system carries about 4,700,000 passengers a day. Metro itself is far from covering the entire urban area in the city of São Paulo and only runs within the city limits. Another company, Companhia Paulista de Trens Metropolitanos (CPTM), serves 23 municipalities that make up the São Paulo Metropolitan Region with seven rapid transit and commuter lines (7, 8, 9, 10, 11, 12 and 13), with a total of 273-kilometre (170 mi) in length, 94 stations, and carries 2,900,000 passengers a day. Metro and CPTM are integrated through various stations. Metro and CPTM both operate as State-owned companies, and have received awards in the recent past as one of the cleanest systems in the world by ISO9001. The headway between the trains both in Metro and CPTM are about one-two minutes in the high traffic times, and three-five minutes in the low traffic periods. The CPTM differs from Metro because it serves other municipalities around São Paulo and also cargo trains in some lines, and because of the larger average distance between stations (except for the Line 9, which has almost no differences to the Metro lines). The first line, Norte/Sul (North/South), later renamed "Blue Line" or Line 1 - Blue, was opened on September 18, 1972, with an experimental operation between Saúde and Jabaquara stations. Commercial operations started on September 14, 1974, after an eight-year "gestation" period that began in 1966, under Mayor Faria Lima's administration. Expansion of the metro system includes new lines. As of late 2004, construction began on a US$1 billion, 12.8 km (8.0 mi) all-underground line (Line 4 - Yellow), with eleven stations, aimed at transporting almost one million people per day. By 2004, Line 2 was also being expanded, with two new stations open in 2006 and another one in 2007. An 10.5-kilometre (6.5 mi) expansion of Line 5 is currently under construction. Plans also include updating the CPTM suburban rail system, which will add several million passengers capacity into the system. It is expected that the São Paulo Metro and CPTM systems will carry about 9.3 million people on average week days by the end of 2018, as opposed to today's 7.5 million (Metro: 4.6 million; CPTM: 2.9 million as of 2014). Metro stations operate from 4:40 AM to around 12:00 AM. As of February 2018[update], tickets cost R$4.00. In 2006, the São Paulo Metro system has started to use a smart card, called "Bilhete Único" (or "Single Ticket" in English). Operational control center of the São Paulo metro. Its current extension does not cover all the areas in the city, however, the subway network, with six lines (two of which are undergoing construction for extensions), is complemented by a network of metropolitan trains operated by CPTM, which serve the capital and other cities in the Greater São Paulo, extending up to Jundiaí, Osasco, Santo André, Mogi das Cruzes, Ferraz de Vasconcelos, and others. The two systems combined form a 370 km (230 mi) long network. Metro is funded by the São Paulo State government and is run by a special self-administered organisation. In terms of service the lines are generally average compared to international standards although certain more prominent lines and stations such as the Yellow Line and the downtown stations feature much more capable infrastructure due to their expected high use and run much more quickly and efficiently while less used lines are historically given less attention and usually run a lesser number of cars. The São Paulo State government has begun to address this issue and is currently building more lines and stations in farther out areas and ordering more cars to run on lines already in service with increase in funding that the state government has been receiving in recent years due to the growth of the Brazilian economy. In May 1977, Metro assumed the administration and commercial utilization of the Inter-City Jabaquara Intermunicipal Terminal, and inaugurated, in May 1982, the modern Inter-city Tietê Bus Terminal, replacing the former Júlio Prestes Terminal. This agreement established that Metro would be in charge of the studies for the planning, implementation, and operation of passenger transportation in the municipal district of São Paulo, either directly or through third parties. Later, the other inter-city bus terminals were integrated into the system, such as Bresser, in January 1988, and Palmeiras-Barra Funda, in December 1989. In January 1990 the inter-city bus terminals were outsourced by Metrô, which through public bidding, contracted Consortium Prima for the administration and commercial utilization of the 4 inter-city bus terminals of the city of São Paulo. This contract included the responsibility for maintenance and conservation of the existing installations, as well as of the expansion and modernisation of the terminals. Train 114, or A14 in current nomenclature. The first cars started operating in 1974, the same year the company's commercial activities were initiated. They were originally made in USA by The Budd Company, and the national building company Mafersa took the prototype to manufacture the model in large scale, and the rest of the 50 trains were nearly identical. The model was based off the A fleet trains of the Bay Area Rapid Transit in California, even using the same Westinghouse 1460 series chopper traction controls, and was to be used along the North-South line, now known as Line 1 - Blue. The initial idea was using two cars during a low-demand operation, then attaching those to others as the demand increased, up to a maximum of six. All of them have a pair of electric engines and a cabin. This model was named Series 100, whose cars received the numbers of 1001 to 1306 (51 trains of 6 cars each). Train 337, or D37 in current nomenclature. In the end, the six-car formation train got standardized. Currently, this fleet is known by "A Fleet", and was planned to be entirely phased out by the beginning of 2015, as the recent modernization processes saw them being converted into two different fleets: I and J. The last Fleet A train was withdrawn from service in February 2018. To reduce the manufacturing costs, the Cobrasma company decided to provide, for the East-West Line, now Line 3. Trains had two cabins only and made use of more advanced ventilation and maintenance systems. This fleet was known by the name of "C". The batch of trains designed for this line were produced by two different national companies, Cobrasma and Mafersa (whose trains got named as "D"). The trains entered service between 1984 and 1986 on Line 3 and remained there for their entire service lives, although in their final years, some of the fleet D trains were transferred to Line 1 where they ran with the older A fleet trains. The only difference between the two is the front mask and some structural framework. Their original technical nomenclature was 300. According to it, the C fleet was numbered from 301 (C01) to 325 (C25), and the D fleet had trains numbered from 326 (D26) to 347 (D47). The C fleet trains were already refurbished as K fleet and the D fleet was refurbished and created the L cars. The refurbishment program for the entire fleet of A, C and D trains was completed in 2018. E fleet: Built by Alstom and entered service between 1998 and 1999. They currently operate on Lines 1 - Blue and 2 - Green. F fleet: Alstom trains specially built for Line 5 - Lilac between 2001 and 2002. Currently known as 1st Phase 500 series. G fleet: Also built by Alstom and entered service in 2008. They currently run on Lines 2 - Green and 3 - Red. H fleet: Streamlined CAF-built trains built in 2010 which operate exclusively on Line 3 - Red since 2014. I and J fleets: Refurbished A fleet trains which operate on Lines 1 - Blue and 2 - Green from 2011. They differ cosmetically as well as mechanically. Fleet I was rebuilt by Alstom and Siemens while Fleet J was rebuilt by Bombardier, Temoinsa, BTT and Tejofran. K fleet: Refurbished C fleet trains rebuilt by a consortium consisting of T’trans, MTTrens, MPE and Temoinsa. They operate on Line 3 - Red just like the original trains. M fleet: The Monorail fleet built by Bombardier between 2013 and 2016 and operates on Line 15 - Silver. P fleet: CAF-built trains from 2013 which run on Line 5 - Lilac alongside the former F fleet. Currently known as 2nd Phase 500 Series. Metro's security agents have police powers and in case of need they will provide assistance. All police matters that occur within the system are directed to the police station of the subway system, DELPOM (Delegacia de Polícia do Metropolitano de São Paulo), located at Palmeiras-Barra Funda station. Several conventional metro and monorail lines are currently under construction or under project. ^ 1,095,000,000 passengers on lines 1, 2, 3, 5 and 15 + 200,400,000 passengers on Line 4 - Yellow. ^ a b c "Estação São Paulo-Morumbi do Metrô recebe visita técnica". Governo do Estado de Sao Paulo. 2018. Retrieved 2018-11-14. ^ Ricardo Meier (29 October 2018). "Estação São Paulo-Morumbi coloca a Linha 4 mais próxima da periferia" (HTML) (in Portuguese). Retrieved 19 February 2019. ^ "Metrô e CPTM transportaram 40 milhões de passageiros a menos nos dias úteis de 2016" [Metro and CPTM transported 40 million passenger less in 2016 compared to 2015] (in Portuguese). R7. 2017. Retrieved 2018-04-08. ^ "Metrô de São Paulo perde passageiros pela primeira vez em 12 anos" [Sao Paulo Metro lost passengers for the first time in 12 years] (in Portuguese). Folha de Sao Paulo. 2017. Retrieved 2018-04-08. ^ Business Insider (24 August 2015). "This graphic compares the best public transportation systems around the world" (SHTML). Retrieved 5 April 2018. ^ * "9 Of The World's Best Subways (PHOTOS)". Huffington Post. April 12, 2010. "ABN+NEWS AGENCIA BRASILEIRA DE NOTICIAS - ABN NEWS BRAZILIAN NEWS AGENCY". Retrieved 7 February 2017. "Terrapinn - conference, exhibitions & industry awards". 1 May 2015. Archived from the original on 22 August 2012. Retrieved 7 February 2017. "Metrô - Companhia do Metropolitano de São Paulo". Retrieved 7 February 2017. ^ "Horários - funcionamento | Metrô São Paulo". www.metro.sp.gov.br (in Portuguese). Retrieved 2018-08-08. ^ "Metrô - Companhia do Metropolitano de São Paulo". Retrieved 7 February 2017. ^ Includes 1,245 cars reported in February 2018 by the Metro, and additional 174 cars (29 trains) of Line 4 - Yellow. ^ a b c "Obras de expansão da Linha 4-Amarela - Metrô São Paulo". Retrieved 7 February 2017. ^ a b c "Obras de expansão da Linha 5-Lilás - Metrô São Paulo". Retrieved 7 February 2017. ^ a b Sioux, Maddox (7 February 2017). "Expansão São Paulo: Linha 4 Amarela viaQuatro". Retrieved 7 February 2017. ^ "Monotrilho Linha 15-Prata - Metrô São Paulo". Retrieved 7 February 2017. ^ a b c "Obras de expansão da Linha 17-Ouro - Metrô São Paulo". Retrieved 7 February 2017. ^ SP, Márcio PinhoDo G1 (12 August 2012). "Metrô contrata estudos para três novas linhas na Zona Norte de SP". São Paulo (in Portuguese). Retrieved 16 January 2019. ^ "Quando o Metrô chegará a outra cidade da Grande São Paulo?". Metrô CPTM (in Portuguese). 10 September 2016. Retrieved 16 January 2019. Wikimedia Commons has media related to São Paulo Metro. Italics indicates planned stations. Bold indicates stations being constructed. This page was last edited on 11 April 2019, at 11:47 (UTC).